Since Dave and I have been married we have lived in many homes. We have finally settled and found a home that we like to call “The house for the kids”. It has a big backyard, the kids have their own rooms, a playroom and Dave and I have our own spaces too. We have been living in our house for almost a year and a half and since then we have made lots of changes. We have blocked up walls, added on doors, painted, wallpapered, added curtains and bought new furniture. And that’s just the inside! As it’s a large family home we have lots of really large walls. To try and find prints or art to fill these large walls has proven to be quite difficult. One afternoon I was sitting having coffee with a good friend of mine, we were looking through home magazines for inspiration (she is also doing a big renovation at her house). Together we come up with the idea of using monograms. We had seen cushions with monograms and we thought why not put this idea on a canvas. I loved it! I bought three large canvases from Art Riot. 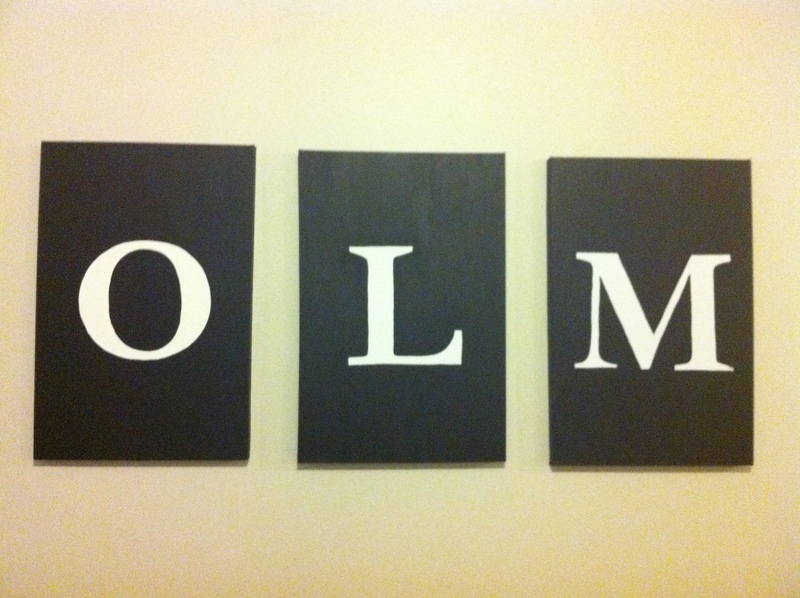 Printed and enlarged each initial letter of our children ‘O’ for Oscar, ‘L’ for Layla and ‘M’ for Molly. I cut the letters out and traced them onto the canvas. I carefully painted around each letter and painted the background of the rest of the canvas. Not only did it fill the space on the wall perfectly. It personalized the room. A quick, inexpensive fix until I find the perfect piece of art to go in its place. Best of all I did it myself!